New Milford High School's Eric Habjan scored 22 points to lead the Green Wave. He is seen here against Notre Dame-Fairfield High School in the SWC tournament. EAST LYME — The state’s cardiac kids through two rounds reside in New Milford. 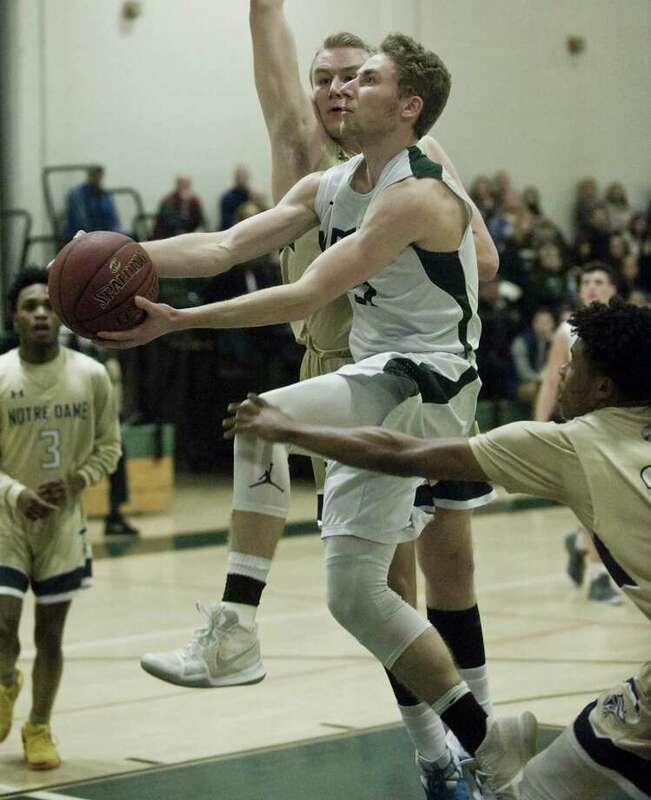 Hunter Skelly came up with a crucial block in the final five seconds, which sealed a 49-47, come-from-behind win over East Lyme, a victory that sent the Green Wave to the Division III quarterfinals. No. 10 New Milford will visit No. 2 Prince Tech on Monday for a spot in the semis. After rallying from a double-digit deficit to upend Bristol Central in overtime in Round 1, the Green Wave matched that and then some Thursday. New Milford fell behind by 19 points to start the third quarter before the switch flipped. Stops led to layups and 3-pointers, and suddenly the visitors had the lead heading into the final quarter. The defense remained tough in the final eight minutes as the teams traded hoops. The stage was set for Skelly’s block after New Milford converted a layup in the final moments. The Green Wave yielded just 15 points in the second half. The SWC is down to three conference representatives in the state tournament as Bunnell (Division II) and Immaculate (Division I) remain. Josian Morales 2 1-3 5 Johnny Fitzmaurice 1 1-2 4 Tyler Bowe 1 1-2 3 Eric Habijan 8 2-7 22 Eric Diaz 6 0-0 15 Anthony Trocchio 0 0-1 0. Totals: 18 5-15 49. Alec Elmer 2 0-0 5 Nate Diaz 2 0-1 6 Drew Menghi 5 1-2 11 Luke Leonard 6 3-5 16 TJ Horner 3 3-4 9. Totals: 18 7-12 47. 3-pointers: NM—Fitzmaurice, Habijan 4, Diaz 3; EL—Elmer, Diaz 2, Leonard.